The use of medicine balls for physical training and therapy can be traced back to ancient Greece and Renaissance Italy. Since then, the medicine ball has evolved into a popular and versatile exercise tool, utilized by athletes and amateur gym goers alike. 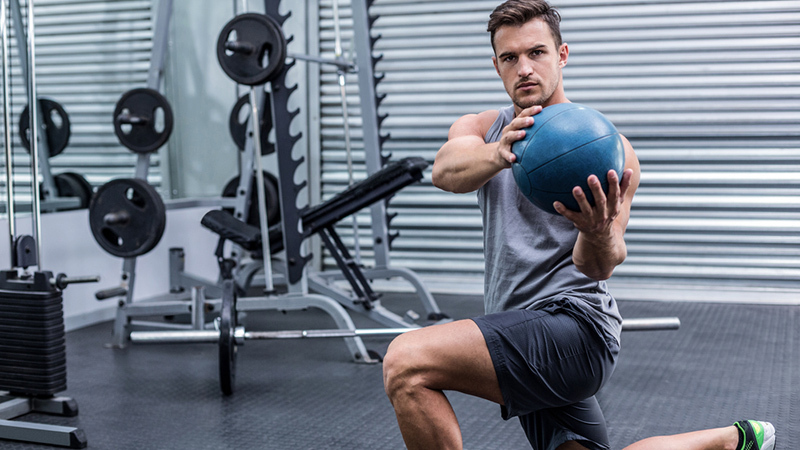 Increase resistance and ramp up your workout with this total-body medicine ball workout that will strengthen your muscles and get your heart rate up, too. Adding the weight of a medicine ball to a basic squat trains your arms, shoulders and core, as well as your legs. You can use any type of medicine ball for this exercise. Hold the ball out in front of you about 12 inches from your body with both hands; don’t let the ball rest on your chest. Stand with your feet shoulder width apart, toes pointing forward. Bend your knees into a squat, going as low as possible while keeping your chest upright and weight over the heels of your feet. Use the medicine ball to counterweight against your hips and keep your knees lined up with your toes. Stand up and repeat for three sets of 12 reps. Try using a large, soft-stuffed medicine ball for this exercise that works your arms, shoulders, back and abs. Stand facing a wall, about 18 inches away, with your feet about shoulder-width apart. Hold the ball in both hands and perform a shallow squat. As you stand back up throw the ball upwards and towards the wall, like a two-handed set shot in basketball. Throw the ball as high up on the wall as possible, and against it hard enough so it rebounds back to you. Catch the ball with both hands and drop back into a squat. Repeat for three sets of 12 reps.
Use a hard medicine ball for this upper-body and core exercise. Get into a push-up position with your right hand resting on the ball. Perform a pushup. Using your right hand, roll the ball to your left hand. 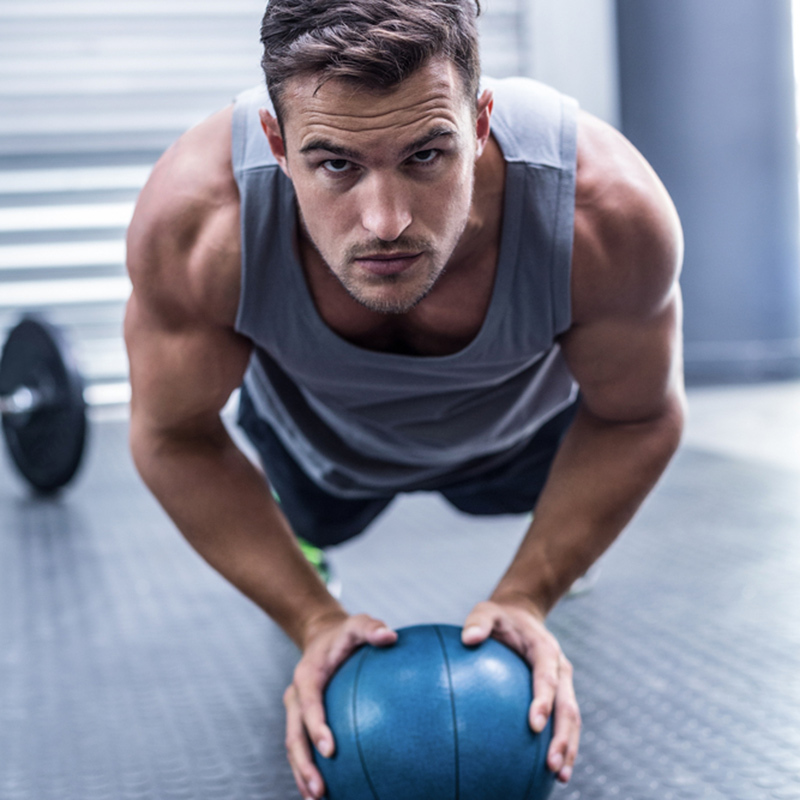 Perform a push-up with your left hand on the ball. Maintain a strong, horizontal plank position throughout the exercise; don’t let your back sag or hips rise. Alternate between left and right sides, completing three sets of 12 reps. Walking lunges are an excellent way to increase dynamic balance, core stability, leg strength and joint range of motion. 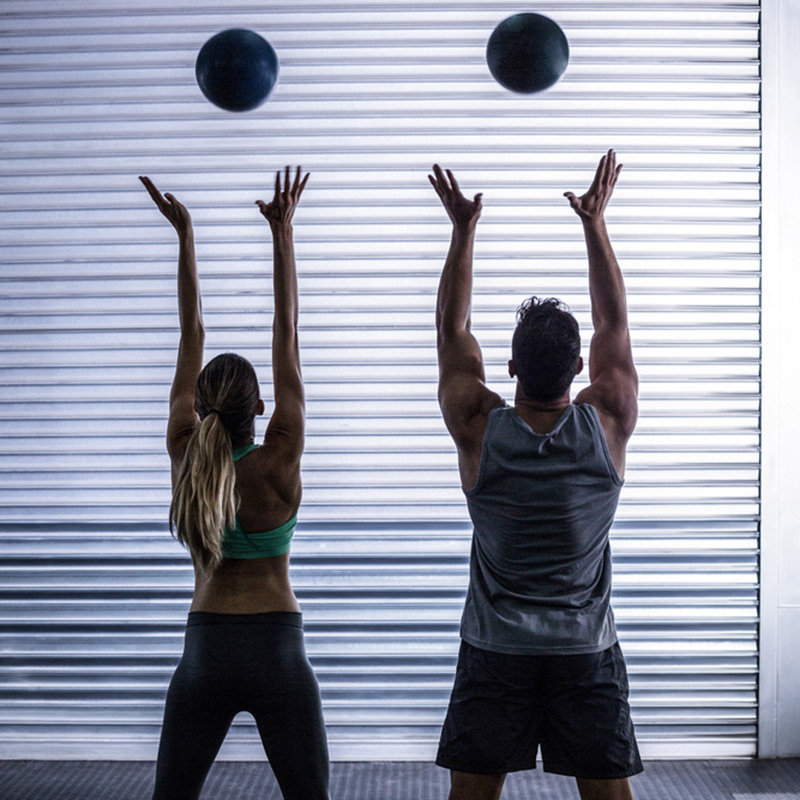 Using a medicine ball without handles maximizes the effect on your grip, chest and shoulders. Hold the medicine ball in front of your chest with your arms extended as straight as possible. Be sure to keep your hands on both sides of the ball, not beneath it. Step out into a forward lunge with your right foot, bending both your front and back legs. When you are at the bottom of the lunge, twist at the waist and move the ball horizontally and to your right. At this point, you should be holding the ball to the right of your front leg. Move the ball back to centre, stand up and step out into a lunge with your left foot. At the bottom of the lunge, twist at the waist and move the ball to your left. Repeat for three sets of 10 reps each leg.